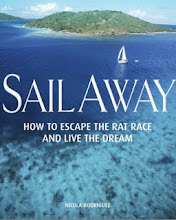 Newsletters from a 40 something couple with two children who left the rat-race to join the cruising life and sail around the world. The 4th of July, America’s big day of celebrating Independence from George III’s England was coming up. On Greta and Garry’s dock we chewed on where to spend it. New York? Too much of a stretch. Washington DC? Too crowded. Historic Yorktown? Maybe. In the end with an ishy plan for Annapolis we set sail. The Urbanna Creek enterance is three miles beyond Towles Point. Jetties and town houses line the channel which is 7 to 8 feet deep but keep to the centre as it shoals. Once past Bailey Point the anchorage, with good holding in six feet, opens out. Once a centre for tobacco trading it boasts several Queen Anne homes, old to you and me. The town provides a free dinghy dock, and the supermarket was in walking distance which made it a good place to provision. There were no museums to “do“, nothing to do apart from go to the Community swimming pool. With temperatures in the high 80s and with the wind scoops keeping us cool we spent time on the boat catching up with school, yacht brokerage and admin . In the afternoon it was time for a dip. At the top of the climb from the dock, en route to the pool, we stopped at the Soda Fountain at Marshalls Drug Store for freshly squeezed lemonade and limeade, truly thirst quenching. Chatting to my neighbour around the Soda counter, old timer James smiled, remembering nothing has changed at the Fountain in and out of fifty years. He hi-fived our little James and headed off. A local agreed “I always know I’ll meet someone I know here”. At $3 each, the Community Pool was great value and a good way to meet the locals such as Wendy, seen here 4th from left, one of the volunteers who runs the pool. Born and raised in Urbanna, she is now raising her own in small town America, the best place to do it. A few days later Wendy, who works in the advertising section of the local paper The Southside Sentinel, arranged for journalist Larry to interview and take pictures of the Seraphim crew. That evening our swim was cut short for the Urbanna Barracudas versus the River Rats swimming regatta. As we arrived, the Barracudas were carefully penning “Eat my bubbles”, on team mates backs. Scores of youngsters competed. With keen supporters rootin‘ and hollerin‘ from their garden chairs and the metal bleachers. The Barracudas, (who only lose against Deltaville) swam to a 351 to 151 victory over the Rats. And dodgy segue of the day, whilst on the subject of swimming champions, I forgot to mention the many Mermaid sculptures around Norfolk which began as a regeneration project. It’s the same sculpture painted many different ways sponsored by local companies. Have a look at www.mermaidsonparade.com. Well our 4th July was full of American Independent exuberance. It was as Americana as it could be. Our anchorage neighbours in Urbanna, Ken and Vicki aboard Luna Loco, invited the Seraphims to join their family for the Boat Parade on the 3rd. Hearing we intended to spend the 4th in Deltaville, Ken and Vicki kindly invited us to be guests at their yacht club, Stingray Point Marina just outside Deltaville. At the crack of dawn the next day we motored down the Rappahannock River. Having a slip would make setting up the bicycles a cinch. Jack pedalled hard on a 2 mile trip to town where we joined the Centenary celebrations for the establishment of Deltaville. The small town parade was all we could have wished for. The Seraphim crew lunched and watched the Deltaville Heritage Parade at the Coffee Creations cafe. Miss Ashley Crittenden (below centre left) who helps run the place has taken part in the parade many times, once singing all the way, holding a torch as the Statue of Liberty. Ashley C explained that “Miss Oyster Festival” was chosen from contestants who proposed the best community project. In her year Ashley C had visited all the old folks in her area. This year her sister is painting recycling bins to be placed around Deltaville. Ashley was shocked when I quipped “nothing to do with swimsuits then”. Bit too un-politically correct for this generation. Fire trucks, clowns and men in Fezzes squashed into small cars and go carts spun around the parade. Different hand signals meant they sped off on another new series of loops and squeals . They were the Shriners, who raise huge amounts for hospitals to help disadvantaged children. Luna Loco‘s kind invitation to stay at Stingray Point was complimented by the welcome we were given by the other boat owners. The swimming pool and club room where the boys could play with space to spare was a super bonus. Somehow we found ourselves one week into July.